Brighton scored their first goals of the season through Joao Teixeira and Kazenga LuaLua to hand Leeds their first home defeat under David Hockaday. On-loan Liverpool striker Teixeira, 21, put Brighton in front early on when he fired into the bottom corner. LuaLua then made sure of victory at Elland Road with six minutes to go when he drove home a 20-yard free-kick. 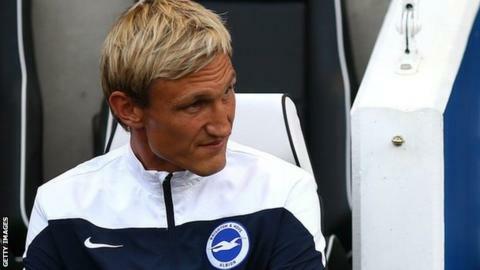 The result gave former Liverpool defender Sami Hyypia his first league win as Brighton manager. It also made for an entertaining evening for Brighton fans watching the Football League's new initiative of a fibre-optic broadcast back to the Amex Stadium. Leeds had received international clearance for loan signing Giuseppe Bellusci from Catania but the central defender started on the bench and watched his side fall behind after five minutes when Teixeira ran onto a through-ball from Bruno to slot home. Defender Inigo Calderon should have doubled Brighton's lead with a header before Leeds improved marginally after the break. A free-kick into the wall from Michael Tonge and a brief glimpse on goal for Billy Sharp before Calderon cleared were the nearest the hosts came to an equaliser. Brighton should have added a second through substitute Rohan Ince who hit the post when clean through. But any chance of a late Leeds fight-back disappeared when LuaLua scored his first goal of the season. United's Jason Pearce brought down Teixeira 20 yards out and LuaLua powered home the free-kick to get Hyppia's reign up and running. "I can't tell you how disappointed I was with our performance in the first half. "I can't explain our slow start. It is a mental thing. We didn't play as a team, we didn't close down and when we got the ball we gave it away cheaply. That's not good enough. "At the end of the day they were better than us. They showed tonight what a good team they are but we lacked a cutting edge. It was a very uncharacteristic performance." "Of course I am grateful to Liverpool for letting Joao come to us and get the games he needs, but it works both ways. "They can benefit too because his time with us can hopefully be a stepping stone towards Liverpool's first team. "He is a young player and Liverpool have a very big squad. A player of his age needs to play games to improve. We have a quality player and I am very happy to have him with us." Match ends, Leeds United 0, Brighton and Hove Albion 2. Second Half ends, Leeds United 0, Brighton and Hove Albion 2. Corner, Leeds United. Conceded by Íñigo Calderón. Offside, Brighton and Hove Albion. Kazenga Lua Lua tries a through ball, but Jake Forster-Caskey is caught offside. Craig Mackail-Smith (Brighton and Hove Albion) wins a free kick on the right wing. Attempt missed. Nicky Ajose (Leeds United) right footed shot from more than 35 yards is too high. Assisted by Lewis Cook. Foul by Craig Mackail-Smith (Brighton and Hove Albion). Stephen Warnock (Leeds United) wins a free kick in the attacking half. Substitution, Brighton and Hove Albion. Aaron Hughes replaces João Teixeira. Corner, Brighton and Hove Albion. Conceded by Liam Cooper. Offside, Leeds United. Tommaso Bianchi tries a through ball, but Nicky Ajose is caught offside. Goal! Leeds United 0, Brighton and Hove Albion 2. Kazenga Lua Lua (Brighton and Hove Albion) from a free kick with a right footed shot to the bottom left corner. Jason Pearce (Leeds United) is shown the yellow card for a bad foul. Delay in match João Teixeira (Brighton and Hove Albion) because of an injury. João Teixeira (Brighton and Hove Albion) wins a free kick in the attacking half. Substitution, Leeds United. Dominic Poleon replaces Billy Sharp. Rohan Ince (Brighton and Hove Albion) hits the left post with a right footed shot from the centre of the box. Assisted by Craig Mackail-Smith following a fast break. Attempt blocked. Kazenga Lua Lua (Brighton and Hove Albion) right footed shot from outside the box is blocked. Assisted by Gordon Greer. Substitution, Brighton and Hove Albion. Rohan Ince replaces Danny Holla. Nicky Ajose (Leeds United) wins a free kick in the defensive half. Offside, Leeds United. Sam Byram tries a through ball, but Michael Tonge is caught offside. Delay in match Íñigo Calderón (Brighton and Hove Albion) because of an injury. Attempt blocked. Michael Tonge (Leeds United) right footed shot from the centre of the box is blocked. Assisted by Sam Byram.